For once, I can't come up with anything especially original to say. 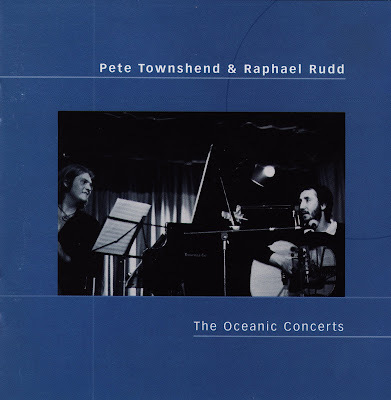 So here's the great 2001 release of selections from two 1969/1970* 1979/1980 Christmastime concerts by Pete Townshend with Rafael Rudd at Eel Pie in London, benefits for the Meher Baba Oceanic group. It's a beautiful document of Pete's softer side. Rudd plays solo on 7 of the 18 tracks here; I've included them to keep or discard at your discretion. Of the others, 8 are duets, and the remaining 3 are Pete solo. The disc is no longer available new, copies are changing hands for dozens of dollars, so here it is on The Rare Stuff, complete with (a TRS first!) full cover scans @600dpi, including Rudd's liner notes wherein he explains his relationship with Pete and the story behind these concerts. *Thanks to commenter Tangled Up in Blue for pointing out the date error - and sharing his own memory of these concerts! Sorry -- of course you're right about the dates! No way he'd have been singing "Let My Love Open the Door" in '69! In fact, I will correct the post. Thanks for the personal reminiscence. That sounds like a wonderful memory. Too bad there isn't film of the concerts (at least, not that we know of so far!). any chance of getting this back up?